They're competing products. The Swiss Army has more stuff, whereas the Leatherman just feels like quality (love how the tools are easy to pull out and solidly snap in and out). But neither fits me well. The Cybertool is geared towards hardware enthusiasts and outdoor enthusiasts, whereas the Leatherman is more for mechanically-oriented people. What about software geeks? Do you have a multitool, and if so, do you find it useful? posted by Jonathan at 7/15/2005 09:26:00 p.m. I've owned a couple different Swiss Army knives since my first at age 10. Right now I have a mid-range (in terms of # of tools) model. I esp. like the pliers it has. I can't believe how much I use the pliers. The phillips head screwdriver (star shaped) is also damn usefull, but would be more so if they had it swing out onto the end of the unit rather in the middle: very hard to get it into drive bays on my tower or the distributor on my girlfriend's car that just broke down. I've played around with Leathermans before but, despite the awesomeness of their pliers, I find the sharper edges hurt my hand in knife mode, that some of the tools are difficult to open (esp. with cold hands) and that it's too heavy. 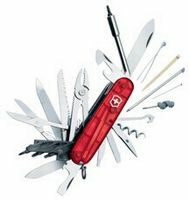 Somewhat related, there's an interesting article in the Guardian about the recent post 9/11 financial troubles the two Swiss Army knife companies have encountered. By Jeff Werner, at 7/16/2005 12:30 a.m.
Jeff - I loved your insights and the Guardian article. Thanks. By Jonathan, at 7/16/2005 9:45 a.m. I have a "girly" black SAK on my keychain; it has a knife, nailfile/screwdriver, scissors, tweezers and toothpick. I've had it for a few years, carrying it every day, and still have the toothpick and tweezers. 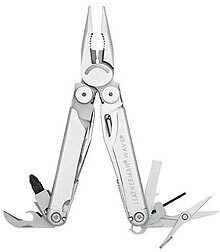 I use a Leatherman Wave on the boat, most of its tools for their intended function. However, I've found that the heft of the whole unit also doubles as a hammer. On another note, my laptop bag is made by Wenger and has the Swiss Army logo. By darusha, at 7/17/2005 8:02 p.m.
Hi Darusha - So you too have a Swiss Army Knife and a Leatherman Wave. You work on a boat? I can see how the Leatherman would be useful for that. I don't really find myself working with medium- to heavy-duty tools much, so the SAK is slightly more useful to me. And even so, the SAK would be more useful to me if I went camping more. By Jonathan, at 7/17/2005 8:15 p.m. I love my Leatherman Juice. I mostly bought it for two reasons: it's orange, and it has the great pliers like the Wave has. Pliers are consistently the most useful tool for me (I deal with wires a lot), so that was the killer app. By Darius Kazemi, at 7/18/2005 10:58 a.m.
Actually, I play on a boat, even though that means working harder (physically) than I do at work. The Leatherman is really a solid tool that's not for any delicate project in my opinion. By darusha, at 7/20/2005 10:00 p.m.
Darusha - Sounds like working on the boat gives you a nice change from work. Darius - You got a Juice? Those look cool. By Jonathan, at 7/23/2005 1:37 p.m. I've got a Leatherman Juice XE6(purple one). It's a great tool! Solid, with lots of features. It can be used indoors and out. At the end of the day I can sit back and even open a bottle of wine with it. By Brenda, at 5/06/2008 3:54 p.m.
Hi Brenda - The purple XE6 looks cool. By Jonathan, at 5/06/2008 6:58 p.m.